Below are resources from the DSU College of Education Lunch n' Learn sessions. If you have ideas for sessions or have things you want to learn about, share them with Kevin Smith. In this session, we learned about our new telepresence robot, Dewey. 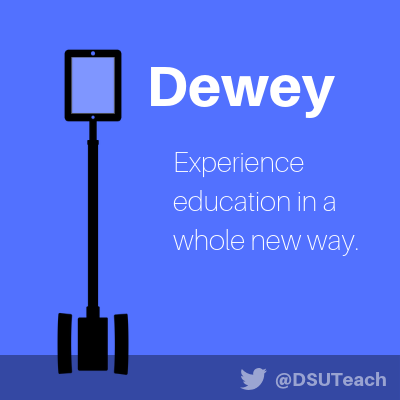 Dewey was purchased through a DSU Innovation Grant. The robot was named after John Dewey who was an educational reformer that believed students learn through hands-on, meaningful learning experiences. Faculty can operate the robot through a simple web-interface. Have students share videos about what they are working on prior to parent-teacher conferences. Have the parents watch that in advance of the conference. Have parents share videos on Flipgrid about their students so teachers can get to know them. This session will focus on tips and tricks for using D2L. We'll look at how to customize the nav bar, home page, and widgets. We'll talk about how faculty share content with students in D2L -- embedded Google docs, Checklists, Youtube, etc. In this session, we'll look at some of our favorite apps, web sites, chrome extensions. In this session, we'll look at tech tools you can use to advise online students. Join Me - this is a free screen sharing tool. Here is a short how to video.